That seems a strange question to ask. The country is a paid-up member of the eurozone core and is one of the few countries in the world to have a triple A credit rating from all three top agencies (S&P, Moody’s & Fitch) and a stable outlook from all. 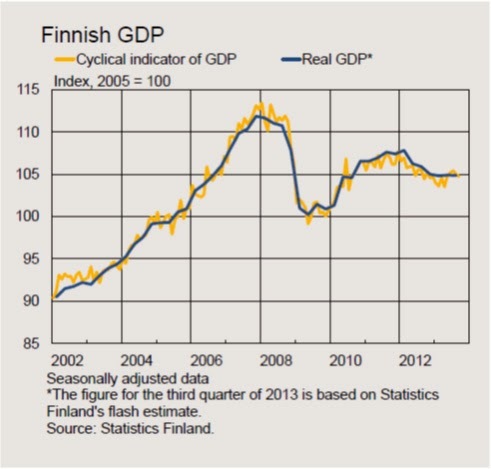 However, as the chart to the left shows (taken from the most recent Finnish Central Bank Macroeconomic bulletin) and today’s GDP data confirm (the Finnish economy contracted by 0.8% in Q4 2013) suggests all might not be well. GDP growth has stagnated and is now teetering on the edge of slipping into its third recession in six years. But what has been causing this? The chart below on the right provides some insight. The first point to note is the collapse in the electrical and electronics industry. This has been largely down to the struggles of Nokia. Formerly a dominant player in the telecoms market the firm has failed to adapt to the changing nature of the market, in particular the smart phone phenomenon, and has seen its market share, profits and share value eroded. The sector has also suffered knock on effects of the reduced global demand in the wake of the financial crisis, the threat of low cost emerging markets and the struggling domestic demand due to falling confidence. Similarly the large metals industry has also been hit by the global downturn and has struggled with price competitiveness. In particular the ship building industry would have been doubly hit by the struggles in global trade and is yet to truly recover. It was previously said that Finland lived off its forests. This is no longer true, or at least it is no longer able to fully. The forest industry and the related wood, textiles and paper industry have struggled with changing technologies. Demand for paper and related products has fallen substantially as digital replacements grow and environmental concerns take hold. Again cheap emerging market products may also threaten in this area. The combination of all this has been falling employment and an accompanied fall in domestic demand, keeping downward pressure on the economy. At the same time Finland is also beginning to run into the same demographic problem facing much of the developed world – the decline of the working age population and the increase in the number of dependants. 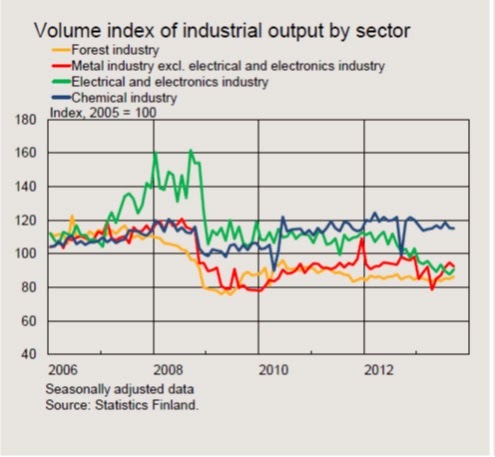 It’s clear that Finland remains a very strong and healthy economy. However, it is clearly undergoing some serious structural changes and may continue to post low growth figures for some time to come. Fortunately, public debt remains low at around 59% of GDP, while the deficit continues to be under control at 2.4% of GDP, and unemployment remains at just 8.1% despite recent increases. This should give the country plenty of space to conduct the structural changes needed. That said, the case of Finland provides further evidence (as we have pointed out for Germany) that the peripheral eurozone countries aren’t the only ones undergoing significant changes.